Each Box contains Five or Six Autographs, One Parallel Card, and 18 Inserts! The popular Rookie Tickets set feature autographs of the top rookies and includes sequentially numbered Playoff Tickets, Championship Tickets, Cracked Ice Tickets, Super Bowl Tickets and Printing Plates parallels. Find autographs of top legends and veterans in autograph inserts Legendary Contenders Autographs, MVP Contenders Autographs, NFL Ink, Sophomore Contenders Autographs, and the all-new Veteran Ticket Autographs. Chase inserts such as Rookie of the Year Contenders, MVP Contenders, Legendary Contenders, Team Quads and Round Numbers, pairing top rookies selected in the same round of the 2017 NFL Draft. Look for hobby exclusive Golden and Silver Tickets! Each hobby box will deliver 5 to 6 autographs. Key Rookies: Mitchell Trubisky, Patrick Mahomes, Deshaun Watson, Christian McCaffrey, Mike Williams, John Ross, Corey Davis, Leonard Fournette, O.J. Howard, Dalvin Cook, Kareem Hunt, DeShone Kizer, Corey Davis, Kenny Golladay, Chris Godwin. ROOKIE TICKET AUTOGRAPHS: Home of the Rookie Tickets Autographs! Look for Cracked Ice (#'d/25) and Printing Plate (1-of-1s)! DRAFT CLASS AUTOGRAPHS: Autographs of the top rookies and includes Gold (sequentially #'d/17) and Platinum (sequentially #'d/1) versions. : This 14k gold 1-of-1 Golden Ticket is a great chase card for collectors. Also, look for the Silver Ticket (#'d/2). 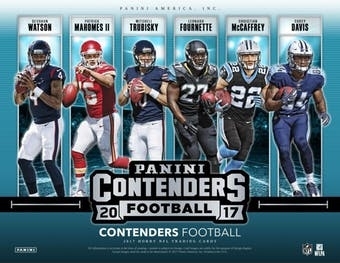 LEGENDARY CONTENDERS AUTOGRAPHS: Find some of the greatest NFL players from the past in Legendary Contenders Autographs (sequentially #'d/49 or less). MVP CONTENDERS AUTOGRAPHS: Look for this autograph insert, featuring 20 heavyweights for the NFL MVP Award (sequentially #'d/49 or less). ROUND NUMBERS DUAL AUTOS: Autograph insert pairs up rookies drafted in the same round of the 2017 NFL Draft (sequentially #'d/99 or less). SEASON TICKET: 400-card base set includes Season Tickets, Rookie Tickets, Rookie Ticket Variations, Veteran Ticket Autographs, and Coaches Tickets. Look for Cracked Ice (#'d/25) and Printing Plate (1-of-1s)! NFL INK: Features autographs of the top NFL Players and includes Gold and Platinum versions. ROOKIE OF THE YEAR CONTENDERS AUTOGRAPHS: Autographs from the top 2017 Rookies and includes Gold and Platinum versions.